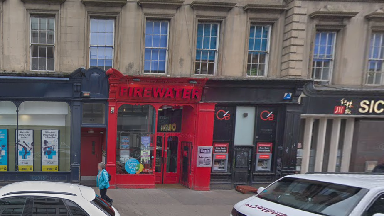 James Connolly attacked the man and woman outside Firewater in Glasgow's Sauchiehall Street. A man who slashed two beggars outside a nightclub in Glasgow has been jailed for three years. At Glasgow Sheriff Court on Thursday 29-year-old James Connelly was found guilty of assaults on Gordon Hunt and Catherine Drummond outside Firewater in the city's Sauchiehall Street last December. Connelly, who was on bail at the time, had told a man he had been in an argument with "two junkies" and wanted to get a "lockback for slitting their throats". Prosecutor Chris Farrell told the court: "The head of security at Firewater saw Connelly with a knife 20 minutes after he spoke to Mr Hunt and Miss Drummond at the bank beside the club. "He saw Connelly go up to Mr Hunt and drive a blade across his face and when Miss Drummond went up to him, she got the same treatment." The trial was told Ms Drummond has been left scarred for life. Sheriff John McCormick said: "This was an unprovoked assault on a woman beggar on the street. "The man was at the wrong place at the wrong time and you used a knife to assault two victims."